I know roughly whereabouts I took it but sadly the light has never been right to find him again, though I've looked. .......... but it's that time of year - what are my goals going to be? what do I want to achieve? Because of some very serious family health problems this year I didn't do as much painting as I would have liked . It was a pretty horrible and very sad year so here's hoping next year is better. I'm taking a Christmas break but having shown you the photographs of this beach in Cornwall in changing light, I thought I would show you just some of the sketches and paintings of the beach in different weather and at different times of day. Katherine sent me this list of 'things to do' and it's popping up on everyone's blog at the moment! so here's my take on it - some of the list seem weird choices to me! 2. Slept under the stars - no, I like comfort! 7. Been to Disneyland - NO!!!! and no wish to! - and does going up Snowdon on the little train count? no? well it was brilliant anyway! 11. Bungee jumped NO WAY!!!! posts might be a bit erratic until after Christmas - and then I have to get some serious painting done - my new years resolution! As they were done experimentally in felt pen line with Polychromos coloured pencils to add the colour, I was a bit worried in case the varnish smudged them. It didn't at all :>) They were absolutely fine. They need another coat and then they can be wrapped. What have you made for friends and family for Christmas? 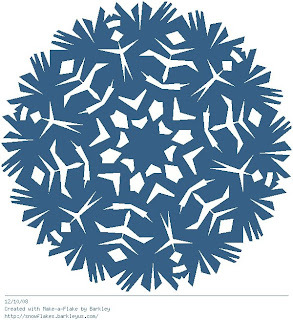 Sherrie at Brush and Baren gave a link for this fun site to cut your own snowflake - this is my effort :>) Have a go here(- warning it's a bit addictive!) I've never managed one so neat and perfect with real paper and scissors! Lindsay did such a great slide show on our new Watermarks blog that I thought I'd show one of one of the areas that I paint. This is the nearest coastline to me at 100 miles. You can see an aerial view of part of the north coast of Norfolk on Paintmap, showing where some of my work was done. Our new group blog Watermarks launches today! You are cordially invited to come and take a look. Members are a really talented, interesting and varied group from around the world. 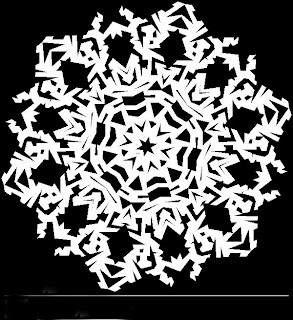 Watermarks is about seascapes, rivers, canals, lakes, streams, ponds, fountains and more, and the different mark making we all use to describe what interests us in our subject matter, light, the people there, a sense of place, abstracting from the subject - all of us with different intentions, media and visual language. We plan to show work, talk about work in progress, artists that interest us, materials - anything and everything to do with our work about water.